Imagine getting all dressed up for a night on the town. You've got it all... new dress, gorgeous shoes, fabulous hair... and no earrings. Actually, lets take it a step further... no jewelry at all. What?! That is just absurd! Well, think about your kitchen cabinetry the same way. A kitchen without the final touches of hardware is, well, naked. 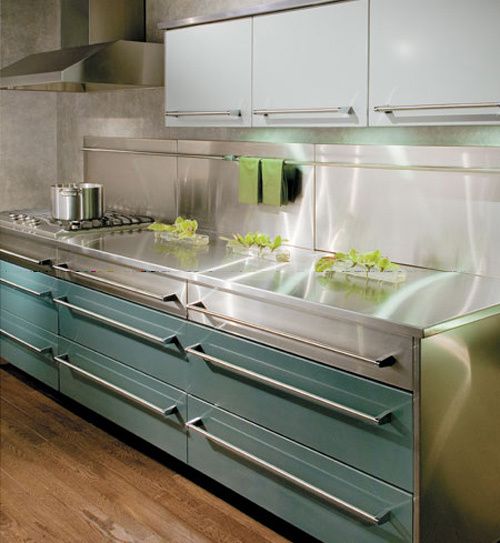 Although it may be the smallest part of a kitchen, the hardware can truly make it or break it. As you see here in this photo to the left, the linear brass pulls simply gives a very vintage feel to the cabinetry without going overboard. However, one could easily change out these traditional looking pulls for some square polished chrome knobs and take the entire kitchen's style in a whole new transitional direction. The next example shows very sleek linear hardware. Here, the cabinetry's lines had already developed the clean simplistic style. The addition of such bold pulls successfully completes the overall modern feeling. In the last photo to the left, these sassy glass knobs are whimsical and airy. But, at the same time, they are also adding a slight touch of "coastal freshness" to the look. In addition, the standard panel door has been modified to a colorful glass door. As you can see, the hardware does a LOT when it comes to really making a design cohesive. Don't let them become an afterthought! The addition of these little "gems" is priceless when it comes to pulling the look of the kitchen together. We have an amazing gallery of decorative hardware here at our showroom! Come in and check it out!! Also, If you mention my blog, we'll give you 15% off of your hardware order!! !